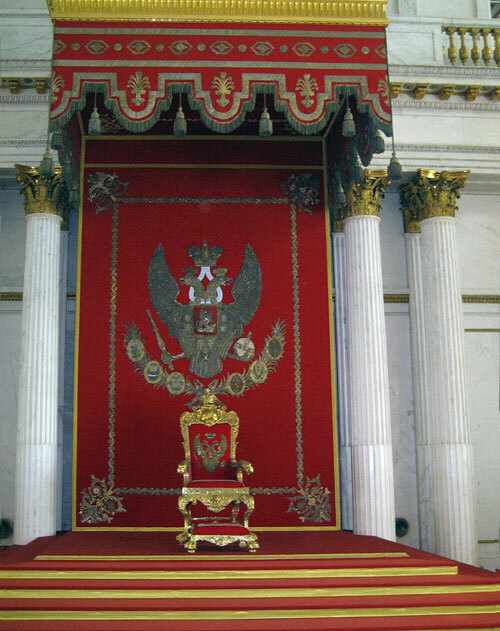 Emperor's throne in the St George Hall (Great Throne Hall) of Winter Palace (Hermitage) in St. Petersburg. On the wall behind the throne is visible emblem of the Russian Empire. After the revolution of 1917 the throne arms were removed from the hall. Throne place was rebuilt in the late 20th century. Great Throne Hall was designed by architect J. Quarenghi in 1787-1795 years, was destroyed by fire in 1837 and rebuilt later.